Are there any fossils of dinosaur skin? The rarest types of dinosaur fossils are those showing skin texture—but not the actual skin itself. This is because of the fossilization process: the body of the dinosaur needs to be in a dry environment and some soft parts mummify; then the mummified parts leave an impression on the rock, and this is very rare. 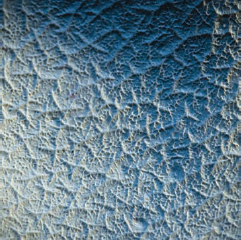 The few fossils of dinosaur skin uncovered to date show that most dinosaur skin was tough and scaly, like modern reptiles. For example, there was the tough, wrinkled skin with bony plates of the Cretaceous period hadrosaur Edmontosaurus. Similar to the hadrosaurs, ornithopods had thick, wrinkled skin with embedded bony knobs of various sizes. Some small theropods, like the recently discovered Sinosauropteryx, may have had feather-like features on its skin for heat regulation. Because it decays quickly, there are very few examples of dinosaur skin that have been fossilized. The impression samples that survive have provided clues, such as the possibility that some dinosaurs had feathers (iStock).